“Undermining family unity in the context of human mobility is detrimental to the mental health and well-being of children and adolescents on the move and generates effects that could last for years or even generations to come,” Dr. Dainius Pūras wrote in a statement to accompany his interim report Friday to the U.N. General Assembly in New York. Pūras’s report comes at a tense moment for U.S. relations with the 193-member body. Nikki Haley, who is resigning as the U.S. ambassador to the body, has criticized the organization’s experts for reports criticizing the United States rather than focusing on problems in other countries. 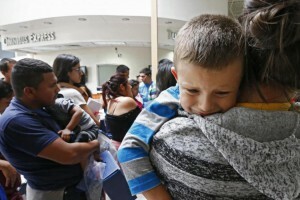 Pūras said he is “following closely the situation with U.S. migration policy and especially with separation and detention of children.” Of more than 2,500 Central American children U.S. Border Patrol separated from their families this summer, 66 remain in government custody. Meanwhile, a “tent city” in Tornillo,Texas, expects to expand to hold 3,800 unaccompanied migrant children by the end of the year. “If a gang is extorting you, if you are a witness to crime, if you have an abusive partner, you have two options, stay and pay the price or flee,” the group said. Pūras’ new report refers to research by public health specialists showing that regularizing undocumented migrants’ immigration status leads to positive mental and physical health outcomes and that an irregular immigration status can lead to depression and anxiety disorders.